Hands Free Mama Books: Letting Go of Screens & Perfection to Grasp What Really Matters! These books are strongly motivating and inspiring! Follow Rachel's weekly suggestions in Hands Free Mama, and by the end of the book you'll be looking your loved ones in the eye and giving them the gift of your undivided attention. Hands Free Life gives you nine intentional habits to help you take your new-found ability to be present into the rest of your life. Only Love Today sustains you with four seasons of inspiration, hope and encouragement. SAY WHAT YOU SEE® for Parents and Teachers: More hugs. More respect. Elegantly Simple. Add three simple coaching skills to your parent or teacher tool kit with Sandy's classic. This short "how-to" handbook makes reward-free, punishment-free interactions with children easy. Imagine always knowing what to say and do. Now you can! Create life-changing playtimes with your own child one week at a time. Theresa provides detailed instruction and shares her compelling story of the difference "special playtime" made for her family. It's the therapeutic version of our Language of Listening® Mastery Class. Want to save time? This easy to read book of 70 tips summarizes current research on interacting with babies and young children. The clear, one-page-per-topic layout includes sleeping, feeding, screen time, potty training, discipline, and more. Tracy also includes numerous references to Language of Listening®! 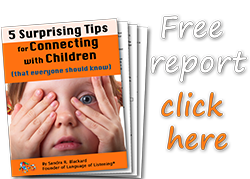 If you want examples of Language of Listening®-type interactions with infants and young toddlers, Janet's books and blog are the perfect choice. As a Resources for Infant Educarers (RIE) teacher and student of pioneering child specialist Magda Gerber, Janet teaches parents and caregivers how to respectfully observe, follow, and trust the child from birth. Elevating Child Care: A guide to respectful parenting is a collection of 30 popular and widely read articles from Janet’s blog that focus on some of the most common infant issues: eating, sleeping, diaper changes, communication, separation, focus and attention span, creativity, boundaries, and more. No Bad Kids: Toddler discipline without shame, is a collection of Janet's most popular and widely read articles pertaining to common toddler behaviors and how respectful parenting practices can be applied to benefit both parents and children. MUST READ! The roots of Language of Listening® and of Faber and Mazlish are evident in this recently revised version of the 1965 classic on listening respectfully to children. Loaded with everyday examples of effective communication. Playful Parenting is a psychological look at what works with kids. "Pretend... that we're really gonna be late and you're really mad." Imagine your child saying that when you're grumpy and trying to get out the door in the morning. Games work for kids and parents, too. The Art of Roughhousing, co-authored by Lawrence Cohen, Ph.D. and Anthony DeBenedet, M.D., shows how appropriate rough-and-tumble play can nurture close connections, solve behavior problems, boost confidence, and more. The Opposite of Worry, Dr. Cohen's most recent book, gives you easy-to-implement, playful solutions and strategies so you and your child can let go of worry, anxiety, and fear and embrace connection, trust, and joy. How to Talk So Kids Will Listen... has sold almost 2 million copies, and Siblings Without Rivalry made it to #1 on the New York Times Best Seller List. These interactive books contain comic strip illustrations of the situations parents and teachers encounter daily and lots of examples of what to say, in the same vein as Language of Listening®. Dr. Laura's workbook walks you through a set of mindfulness skills and exercises that actually change your brain, so that you can become the calm, emotionally generous parent you want to be. Doing the exercises will help you identify your triggers, recognize your self-regulation successes, and change your reactions. Unconditional Parenting: Rather than asking, "How can we get kids to do what they're told?" Dr. Kohn begins by asking, "What do kids need, and how can we meet those needs?" A philosophical match for Language of Listening®. Punished By Rewards: Instead of "do this and you'll get that," Alfie Kohn points the way to a more successful strategy based on working with people instead of doing things to them. "Do rewards motivate people?" asks Kohn. "Yes. They motivate people to get rewards." Seasoned with humor and familiar examples. The Myth of the Spoiled Child: Parents are accused of being both permissive and overprotective, unwilling to set limits and afraid to let their kids fail. In his lively, contrarian style, Alfie Kohn systematically debunks these beliefs. New research reveals that helicopter parenting is quite rare and, surprisingly, may do more good than harm when it does occur. The major threat to healthy child development, Kohn argues, is parenting that is too controlling rather than too indulgent. This book written by the founder of the internationally acclaimed Austin Montessori School demonstrates the value of validation in the classroom for helping children turn their lives around. The skills Donna uses are very similar to those we teach in Language of Listening® Mastery Class. In No Drama Discipline, Dan and co-author Dr. Tina Bryson explain how to connect and redirect. Their book explores the link between a child’s neurological development and the way a parent reacts to misbehavior. If you've seen anyone make a fist and demonstrate flipping your lid, that's Dan's model. Aware is a hands-on guide with another visual model that will enable you to become more focused and present, as well as more energized and emotionally resilient in the face of stress and the everyday challenges life throws your way. Great tool for cultivating "a state of receptive awareness" that will benefit you and your child. In Brainstorm, Dan busts a number of commonly held myths about adolescence. Drawing on important new research in the field of interpersonal neurobiology, Siegel explores exciting ways in which understanding how the brain functions can improve the lives of adolescents, making their relationships more fulfilling and less lonely and distressing on both sides of the generational divide. Dibs will not talk. He will not play. The story takes you through his long journey from being labeled as "mentally defective," to emerging as a gifted and lovable young man. A captivating account that introduced play therapy to the world. Though we've removed questions and added boundaries, the play therapy roots of our Language of Listening® Playtime Class are clear in Axline's book. There Is Nothing Wrong With You: Going Beyond Self-hate outlines "a compassionate process for learning to accept yourself exactly as you are." Great book for anyone seeking the peace (and peaceful parenting) that comes from loving oneself more. Profound topic, simply presented. There Is Nothing Wrong With You - For Teens, helps teens find self-acceptance right when they need it most, and gain a deeper understanding of themselves and others. Simple presentation, fun and easy to read. Highly recommended to open important conversations with teens! Definitive textbook for professionals co-authored by Dr. Garry Landreth, world renowned play therapist and mentor to the founder of Language of Listening.® Contains partial transcripts of his 10-session CPRT training.*Drs. Landreth & Bratton are coauthors of CPRT Treatment Manual (below). Comprehensive treatment manual for professionals who wish to train parents to become therapeutic agents for their own children as Dr. Landreth did for *coauthor Sandra Blackard, who became founder of Language of Listening®. Includes 10-session CPRT outline, parent handouts, etc. A delightful children's book showing how play reveals a little girl's thoughts of mommy away on a business trip. Great for easing children's fears. Elisabeth walks by your side as your personal cheerleader and guide as you step into, back into, or upward in the job market. An experienced job-lander herself, she thinks of everything. Her book not only has you covered, but it will shift your perspective on what it means to be part of a team. Truly a must-read for the professional part of your life.